“The land where the earth ends” is the meaning of a native Aymará word, “chilli” and believed to be how Chile got her name. She is a long, sleek and slender country located in southwest South America. Chile is only one of two countries in South America that does not border Brazil (the other is Ecuador). Sometimes referred to as the “Shoestring Republic” her neighbors are Peru and Bolivia to the north, Argentina to the East, the Pacific Ocean to the west and Antarctica to the south. She has one of the longest coastlines in the world, at 2650 miles and is only 220 miles across at the widest point. The great Atacama Desert, located in the northern portion of Chile, is a very dry and desolate place with some areas never recording even a drop of rainfall! The southern portion of Chile is cold and rainy with glaciers at the southernmost tip (this is where the penguins live). Both the north and south are sparsely populated in comparison to the rich, central valley of Chile where the fertile basin is fed by a Mediterranean climate and home to Chile’s capital city, Santiago. The majestic Andes mountain range provides a natural boundary all along the eastern border. They call their language Castellano; it’s a Spanish dialect and considered the official language. Chileans are known for speaking very fast and having their own melodic speech that is quite distinctive from other Spanish speaking countries. Anymará and Mapudungu are native languages spoken by the five percent of the indigenous population. The majority of natives are from European and Indian descent. Chile has made great strides in developing a middle class. The country is known to be an economic powerhouse in South America, attracting large number of immigrants due to its political stability and economic prosperity. Roman Catholic is the national religion and many festivals throughout the year are focused around their religion. Huasos are what the Chilean cowboys are called and rodeo is a much loved sport, second only to soccer, which is their national sport. The Andes provide wonderful skiing and snowboarding and the Pacific Ocean offers all kinds of beach activities including surfing, kayaking and of course fishing. Chile is considered an adventure rich country. National Day is celebrated in a big way on September 18, the date in 1810 when Chile gained independence from Spain. You will find Chileans in colorful costumes dancing the Cuenca, their national dance, in the streets. The ladies wave their white handkerchiefs in the air while a giant festival ensues with traditional food and drink to celebrate. Chile has taken a leading role in the export of salmon and is now the largest exporter behind Norway. With over 100 wineries in the country, Chile now ranks fifth in the world as a wine exporter and their wine is becoming world renown. Nearly everything imaginable can grow in its fertile central valley. It is common to find Chilean fruits and vegetables in grocery stores in the United States. Chile is also rich in minerals. She has the largest reserve of copper in the world, (one quarter of the world’s supply) along with lithium, iron, silver, salt, zinc, manganese, gold, coal and iodine. You may remember the dramatic rescue which unfolded in Chile a few years ago, when a mine collapsed trapping 33 miners some 2300 ft. underground. They emerged 69 days later as the whole country (and much of the world) erupted in euphoria. They became known as “Los 33”. Chile has many islands in the Pacific but its most famous and most remote island, lies 2800 miles off the coast. It is called Easter Island or Isla de Pascua. Easter Island was named by Admiral Jacob Roggeveen, a Dutchman, who discovered it on Easter Day in 1772. The island is home to 867 Moais, which are large monolithic human figures carved from volcanic rock by the early natives. They are believed to represent deceased chiefs and deified ancestors, with very large heads. The largest was 33 ft. high and weighed 82 tons and one, unfinished Moai, was 69 ft. high and weighed 270 tons. Chile is part of what is called the ring of fire; a very active earthquake zone. Chile gets the prize for the largest quake in recorded history, coming in at 9.5 on the Richter scale back in 1960. Large quakes are common there and something to which the citizens have grown accustomed. They even enjoy a drink called earthquake. Speaking of fire, Tierra del Fuego or “Land of Fire” is an archipelago off the southern tip of South America. Back in 1520, Magellan named these islands “Land of Smoke,” because of all the smoke rising from Indian campfires on the islands’ shores. The King of Spain however, thought “Land of Fire” was far more poetic and changed the name. Tierra del Fuego is divided between Chile and Argentina, with Chile claiming the majority, at 70 percent. 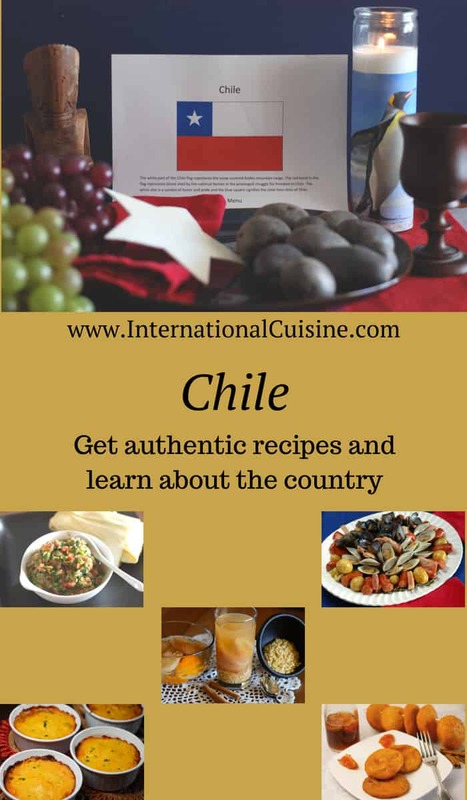 The cuisine of Chile is rich in flavors and tradition and definitely has regional differences from the north to the south. The many immigrants (especially the Spanish) have influenced the cuisine along with the customs of the indigenous people. Of course empanadas are cherished, as every South American country lays claim to their own version. One of their favorite foods includes a sandwich of German origin, called El Lomito. It is made with pork, sauerkraut, avocado, tomato and mayonnaise and is a “must have” when visiting Chile. Seafood is abundant and loved all over the country. Razor clams with cheese is another Chilean favorite. Potatoes and corn are used in many dishes and a salsa made of cilantro and onion, called Pebre, is found on nearly every Chilean table. There were so many wonderful choices it was hard to decide what to make for our meal. I finally picked what I felt was considered the most authentic dishes of Chile. And yes Chileans love to eat, they eat four meals a day. Dinner is served very late, typically after 9:00 p.m.
We set the table in the colors of the Chilean flag (Red, White and Blue). Their flag is very similar to the state flag of Texas in the United States and came into being from a suggestion to its designer by the U.S. Envoy, Poinsett in 1817. We decorated with many unusual varieties of potatoes and some candles adorned with penguins. We put on a little Reggaeton, which is popular music in Chile. (Any of you who have ever taken a Zumba class will recognize this infectious beat.) We began the meal with a popular non-alcoholic drink called “mote con huesillo”. 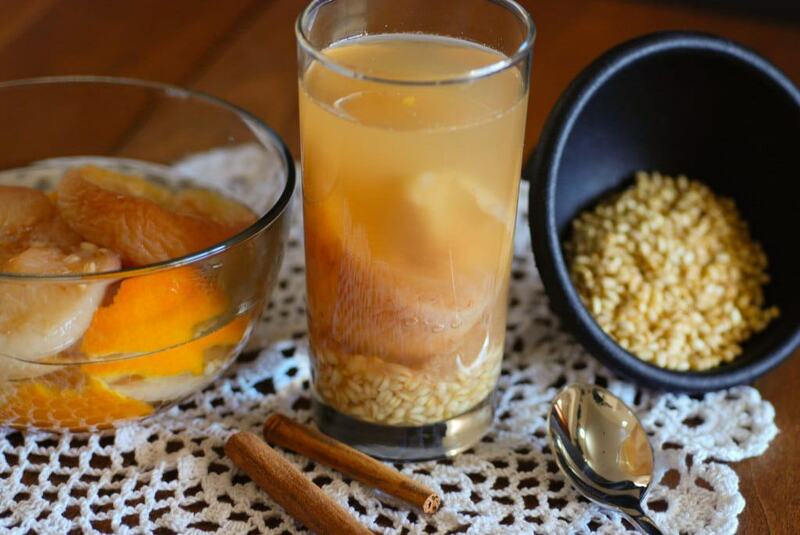 This is a slightly sweet drink made with hulled wheat and rehydrated peaches. It is served cold and sold at street stands throughout Chile. In fact there is a saying in Chile “es mas chileno a que el mote con huesillo?” Which means “is it more Chilean than mote con huesillo?” Needless to say this is a yummy drink and classically Chilean. For our starter, we enjoyed the humitas with pebre sauce. 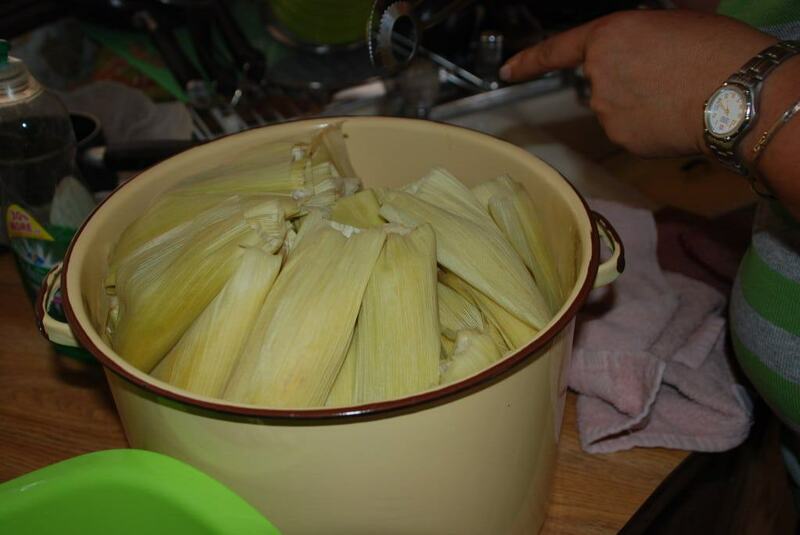 These corn tamales were a lot of work to make. I had the pleasure of making them with some neighbors of mine who are actually from Mexico but really knew how to make these the old fashioned way using a molino (a grinder used just for the corn kernels to get the proper consistency). Served with the Pebre salsa, which is made mostly of cilantro and onion, with a hint of chili and tomato, was the perfect accompaniment to the corn tamale, called Humita. 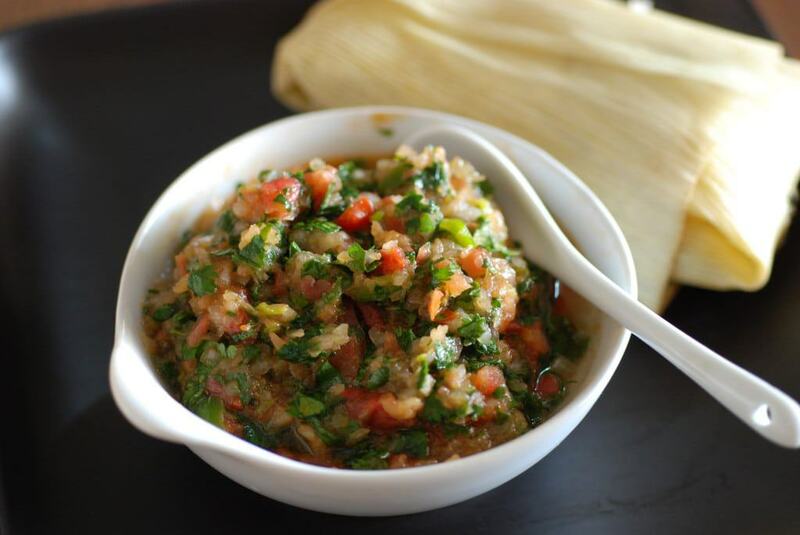 I can see how this salsa is loved on many dishes, from meat to bread, in soups and casseroles… you get the idea. Next up was the main dish and oh my, it was a boatload of heaven. Curanto basically means, cooked on hot stones. On the island of Chiloé, where this dish originated, it was made in a pit in the ground on hot stones. It is still made that way there on special occasions but stovetop and BBQ versions are also very popular. 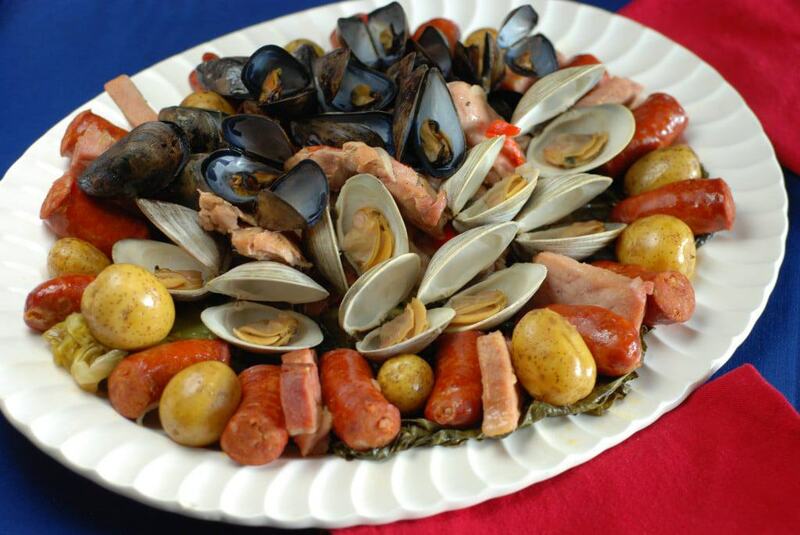 The dish has all sorts of seafood, pork, chicken, chorizo, potatoes covered with a type of cabbage leaf and cooked in wine. The result was outstanding. We loved it, although fair warning, it is a feast, a ton of food, so be very hungry! 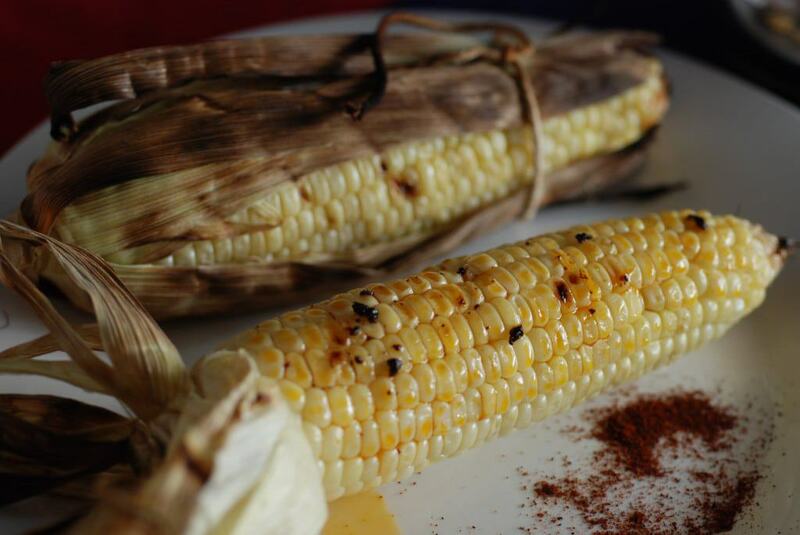 The main course was served with a Chilean corn on the cob that was also cooked on the BBQ. To be honest, although delicious, it was too much; the Curanto was more than enough food on its own. For dessert (we waited awhile) and enjoyed what is called Sopaipillas. We made the sweet type. (There is also a savory type that is typically served as bread and topped with butter or pebre.) 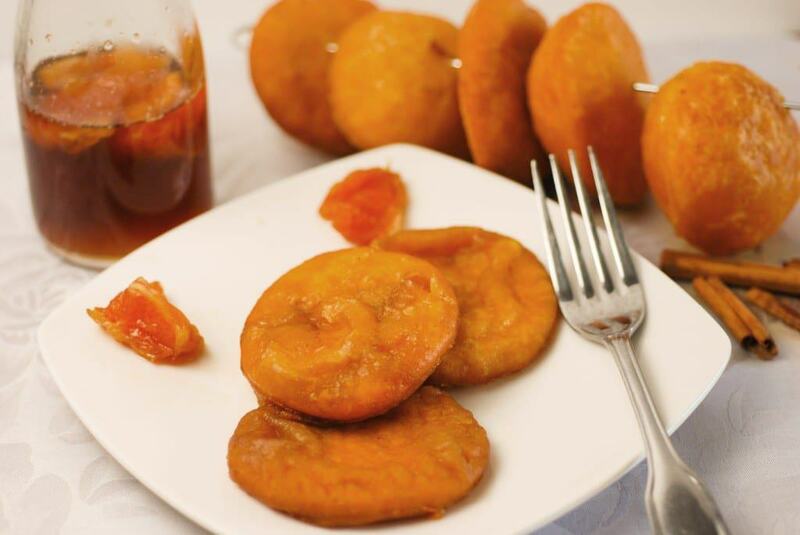 What we made was basically a fried doughnut dipped in a sugary sauce, seasoned with cinnamon and oranges. It was scrumptious! The Chileans love a drink called Pisco, which is similar to a brandy and made in the Elqui Valley. It is commonly mixed with soft drinks, in particular Coca Cola, and is called Piscola. However, the most common version is what is called a Pisco sour, where it is blended with lemon juice, sugar, ice and beaten egg whites, served in a champagne flute and considered their national drink. Chileans are a people with much national pride. 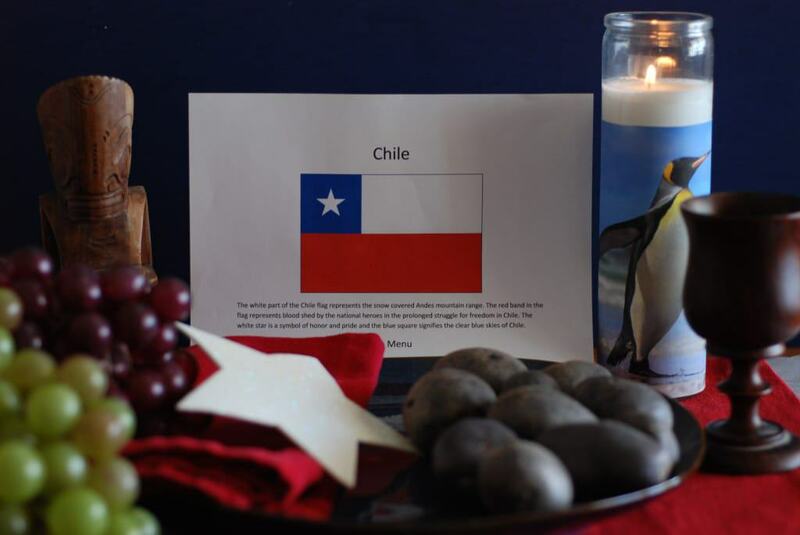 It is more important to be Chilean than whatever your ancestry happens to be. When Chileans get married they each keep their maiden names, so married couples will have different last names. 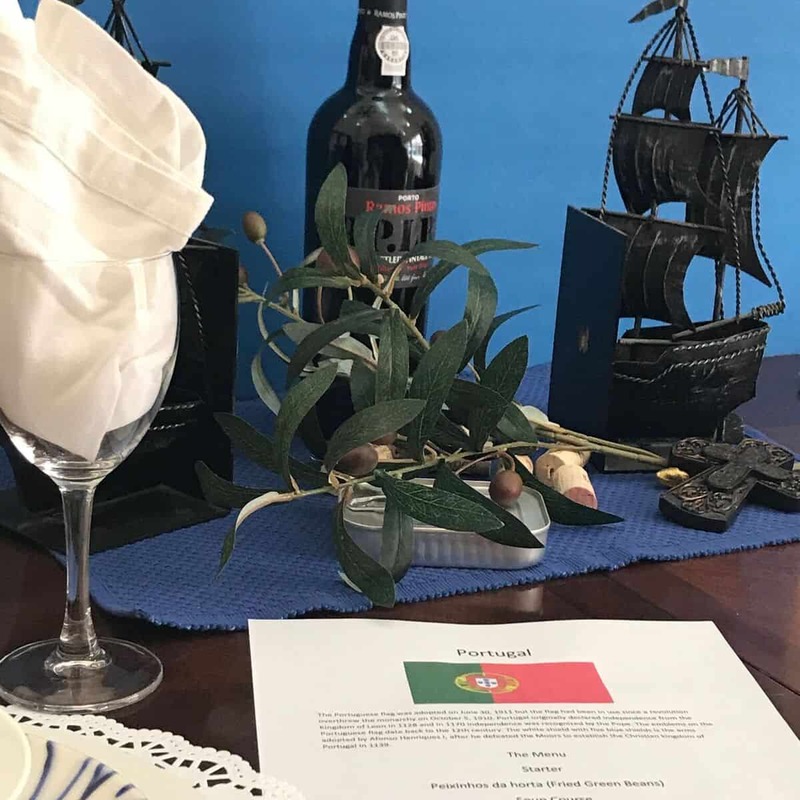 If you are invited to a meal, it would be appropriate to be about 20 minutes late and be sure to bring a small gift like flowers or a dessert wine. Salud is the most common toast in Chile and it means “Cheers”. If you happen to pour wine, don’t use your left hand, it is considered taboo. My brother and sister-in-law are hosting a foreign exchange student this winter who just so happens to be from Chile. His name is Rodrigo, a junior in high school. I had the privilege of meeting him and of course, I had to make a nice Chilean lunch to help him feel right at home. He was really fun to talk to and anxious to share his culture with me. 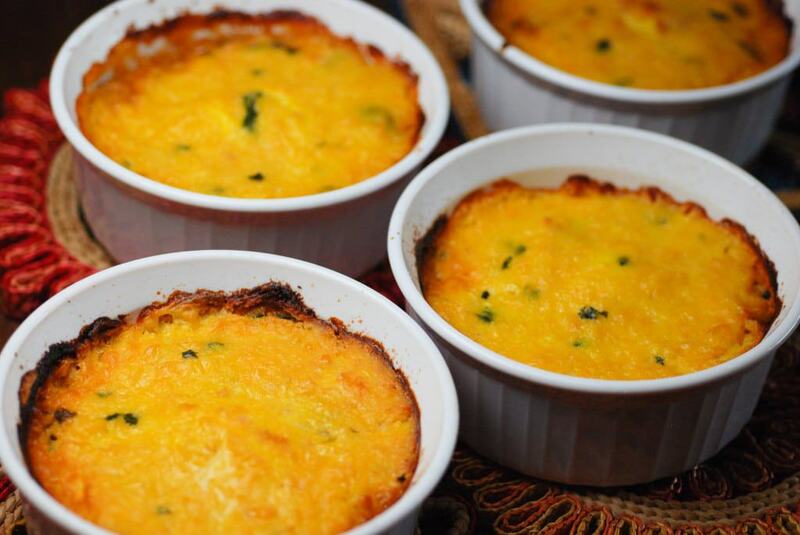 For his lunch, I prepared what is called Pastel De Choclo; sort of a shepherd’s pie but with a corn topping. The best part; Rodrigo ate the whole thing and exclaimed three times during the meal that it was just like home! I could not have asked for a better compliment. He took a look at the menu for the Chilean meal I had prepared earlier and said he was sorry he missed it. He felt Curanto was a perfect reflection of his country. Craving more? 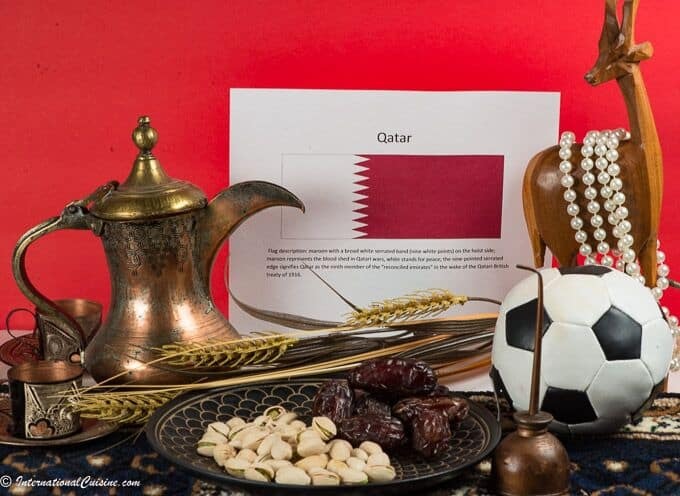 Be sure to join the culinary and cultural journey around the world at, Internationalcuisine.com, so you don’t miss a thing. It’s free. You can also find me on Instagram, Facebook , Pinterest and Youtube, to follow along on our incredible journey.